Sabin Lomac, left, and Jim Tselikis at Portland Head Light. 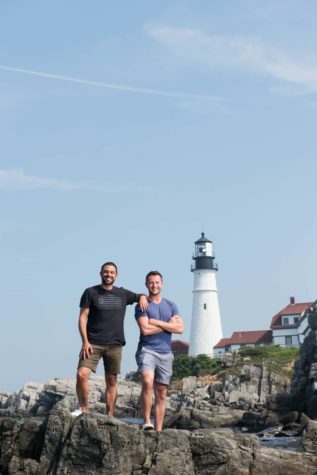 The founders of Cousins Maine Lobster, they introduced their first food cart in Maine this summer at Fort Williams Park. Waiting for an order at the cart at Fort Williams Park. 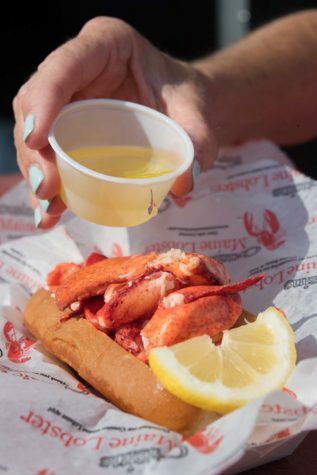 The Connecticut-style lobster roll is served warm with butter and lemon. Cousins Maine Lobster also offers a traditional Maine-style lobster roll with mayonnaise. 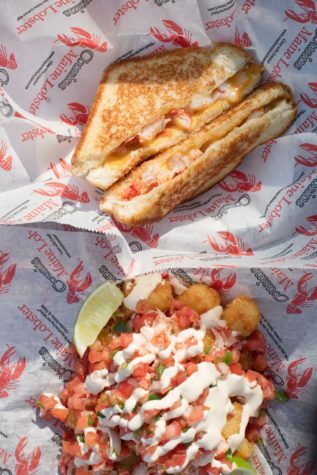 Lobster grilled cheese and lobster tots—tater tots with lobster, pico de gallo, and cilantrolime sauce. 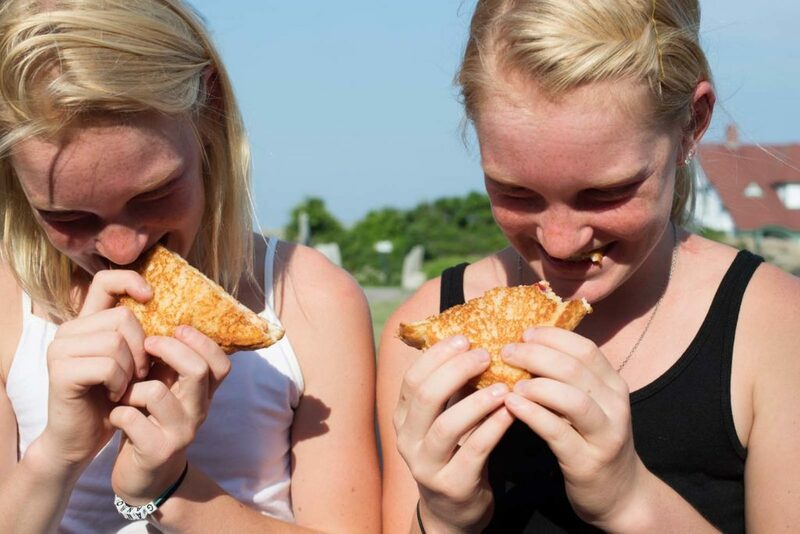 Eleven-year-old twins Morgan and MacKenzie Hays from Palm Peach, Florida, taste their first lobster in a grilled cheese sandwich from Cousins Maine Lobster. The cousins and I find a patch of shade and sit on the grass, shoes off. Friendly and engaging, they are on an extended break to visit family in Maine. Lomac, whose fiancée, Erika Hartounian, and baby son, Enzo, are in tow, has just wrapped the first season of his new Cooking Channel series, Seaside Snacks and Shacks, crisscrossing the country for alligator sliders on the Louisiana bayou and “campfire whitefish” in Michigan, along with local specialties: from the Shack in Old Orchard Beach, the Garage BBQ and Salty Bay in Scarborough, and Silly’s in Portland. 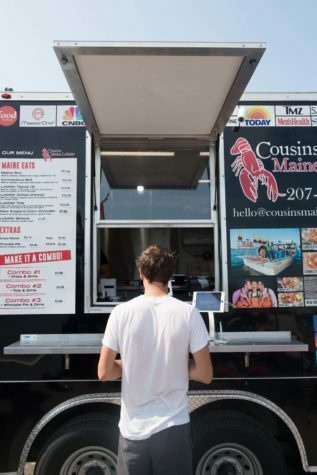 A book, Cousins Maine Lobster: How One Food Truck Became a Multimillion-Dollar Business, was released in April, garnering positive reviews for the cousins’ lighthearted telling of their boot-strapping success story. Cousins Maine Lobster buys all of its lobster from eight Maine buying stations it partners with; the meat is processed in Portland and shipped to the various locations, which as of August included a restaurant on the beach in Taiwan. The rolls are from New England–based Country Kitchen, and the whoopie pies are baked in Maine. “As we grew, we wanted to make sure that the logistics and the supply chain were buttoned up and very secure,” says Tselikis. Initially, the cousins did their trainings in California, but now they bring all of their franchisees to Maine to immerse them in the culture that is the heart of their business. “They see how hard it is—hauling ten lobsters up and throwing nine of them back,” he says. “They come to Jimmy’s house and sit in the backyard with his mom,” says Lomac. For him and Tselikis, family is a recurring theme extending well beyond the close-knit circle of relatives that includes Tselikis’s sister, Annie Tselikis, the executive director of the Maine Lobster Dealers’ Association. Barbara Corcoran, the celebrity investor the cousins convinced to partner with them on ABC’s Shark Tank, is also considered family, says Lomac. Corcoran first visited the cousins in Maine to film some teaser footage before the October 2012 episode was scheduled to air. Lomac gave her a list of hotels, but said she was also welcome to stay with him at his mother’s house in Scarborough. Corcoran took him up on the offer. “We shot during the day, and at night we’d play Scrabble and drink wine—it felt like family immediately, and it’s only gotten stronger,” says Lomac. The producers of Shark Tank had approached the cousins just two months after they launched their first food truck. Recognizing they needed mentorship, the cousins prepared for the show—in which entrepreneurs compete for investors—by watching 50-plus episodes and grilling each other with questions. Corcoran’s resulting $55,000 investment and her business acumen are “the gift that keeps on giving,” says Tselikis. “But we didn’t just focus on TV, we focused on the product and Maine and the story.” His sister has also helped them tell this story, connecting them to the lobster industry in their early years and keeping them up to date on developments. “We would call her: ‘Annie, we’re going on CNN; how should we talk about this?’” says Lomac.